Disclaimer: I am not being compensated in any way to write this review. This review is designed to serve as a brief summary of the book, to inform, and to encourage readers to pursue the topic further. 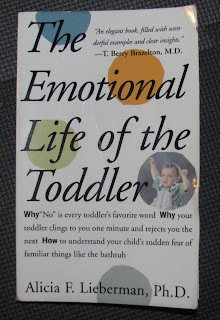 The Emotional Life of the Toddler describes just what the title promises. This book offers a sensitive and in-depth look at toddlerhood, with the aim of helping parents gain awareness and skills for dealing with this age group. This book is informative and well researched, yet easy to read and highly palatable. You can leaf through it to the relevant parts, or read through the whole thing without it sucking up too much of your valuable time. 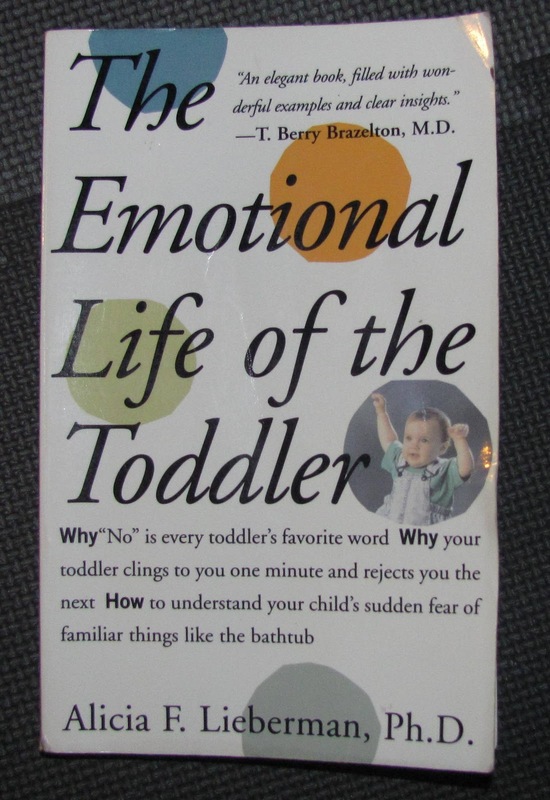 Although The Emotional Life of the Toddler is dated (published in 1993), it is still relevant to today's parents. Dr. Lieberman's body of knowledge surrounding toddler emotions is thorough, and her tone is empathetic and respectful (likely because she has research and clinical experience in infant mental health and early childhood trauma). The result is a book that is particularly relevant to anyone interested in Attachment Parenting or other type of gentle parenting style. Regardless of parenting style, The Emotional Life of the Toddler is relevant for any family with a toddler. The book offers sound advice and a solid foundation for understanding and relating to a very young child. Three of the chapters are devoted to temperament, or personality types, among toddlers. I found these sections revealing as well as humorous. The author's intimate knowledge of each temperament allows the reader to feel connected and understood. In addition to straightforward descriptions, Lieberman uses a series of brief case studies to illustrate some of her points. I found these vignettes helpful, but with limitations. Some case studies serve as excellent examples, while others seemed too idiosyncratic to be generally applicable. Still, I enjoyed reading them and learning about the complexities of toddler emotions. Another odd aspect of the book is that the author devoted an entire chapter to divorce. While this is a topic that affects many of us, and it certainly affects toddlers, this chapter felt a bit out of place in this book. I would have rather seen a chapter devoted to a more general discussion of tension in the home or fights between parents, with divorce included in the discussion. Nonetheless, The Emotional Life of the Toddler is an indispensable addition to any parents' library. Overall, I loved this book and I highly recommend it to anyone with a toddler or infant approaching toddlerhood. Two thumbs up! · The hallmark of toddlerhood is the dichotomy between independence and dependence. The toddler continually seeks a balance between exploration of the world and a safe, loving connection to parents. · A secure base from the parent supplies the physical and emotional scaffolding upon which the toddler develops confidence to explore the world and grow into his own separate person. The most effective secure base provides love, affection, protection, and respect for the toddler as an individual. A sound secure base also allows the toddler to explore the external and internal world of emotions. · Toddlers have intense, vivid, and very real emotions that are hard for them to express and cope with. How toddlers are treated in response to their emotions impart lifelong lessons in how to manage those feelings. · Problems between parent and toddler commonly arise due to disagreements over what is safe (exploration) and what is an appropriate level of connection (emotional or physical). · Problems are best resolved (and prevented) through development of a partnership between parent and toddler. A goal-directed partnership is useful in finding compromise and meeting the needs of both parent and child. For example, picking up the toys together is a way to engage in a goal-directed partnership. · Exercising benevolent authority, rather than using shame or fear, is an effective way to ensure toddler compliance. (Read this and this for more information and for examples of how to gain toddler compliance and manage defiance). · Sensitivity to the child's feelings and needs, helping the toddler find words to describe feelings, as well as being silent when words aren't enough, are powerful ways to encourage the partnership. (Read this for suggestions on how to effectively speak to a toddler). · Parents' anger and frustration over the toddler need not destroy the partnership or disrupt the secure base. Toddlers learn that intense emotions are acceptable and tolerable. When they see their parents recover from outbursts, followed by an apology and explanation, the partnership is restored. · There are 4 general toddler temperaments: Easy, Slow To Warm Up ("shy"), Active, and Difficult (very rare). Temperaments are not permanent or immutable. A child may exhibit signs of more than one temperament which may change over time. A child may not necessarily retain the same temperament throughout childhood. · Each temperament will respond differently to different parenting styles so it's important to understand and work with a toddler's individual personality. · "Active" toddlers need a physically safe environment with only a few clear, consistent boundaries. Thorough baby-proofing and the parents' level of energy and patience are main concerns. · "Slow to Warm Up" toddlers need time and space to acclimate to new people and environments. Providing support for the child's pace of adaptation is a central concern for parents. · Problems may arise when the parent either doesn't understand or feels uncomfortable with their child's temperament. For example, an outgoing parent may pressure a shy child to interact with others before he is ready. A fearful parent may struggle to give an active toddler enough freedom to roam. · Toddlers have immature cognitive development. Fears and anxieties usually arise because they make incorrect conclusions about reality. Issues related to permanence (objects, people, body parts, etc.) are common sources of toddler fears. Operating from a secure base, parents can help toddlers learn what threats are real in order to alleviate anxiety. Minimizing or ignoring fears, or using ridicule and blame will aggravate those anxieties and strain the parent-toddler relationship. · Play is an important and powerful way for toddlers to work through their fears and anxieties. · Toddlers enjoy "messy" play as an avenue for exploring their newly discovered bodily secretions (urine, feces, mucus, blood, saliva, etc.). Finger paints, play-dough, water, dirt and the like all serve as valuable representations for this phase of discovery (and they're easier to clean than poop on the wall!). · Conflicts between parents don't have to disrupt the secure base for a toddler as long as both parents put the needs of the child ahead of their interpersonal issues. · Quality child care may be provided by someone besides the toddler's parents. Factors that influence the quality of childcare include: stability of care, caregiver training, adult-child ratio, group size, and the presence of another adult. · Toddlerhood shares some features in common with adolescence. With an established secure base, an attitude of partnership, and a habit of parent-child communication, parents of toddlers are likely to build effective skills that can be used when similar issues arise again ten or so years later.